Windows require regularly and properly done sanitising to be sparking clean and provide a clear view. You can use our window cleaning services for your home, office or other estate, located in the area of Finsbury Park and the neighbourhood. Our cleaning personnel use various methods for sanitising which ensure removal of stains, dirt and dust from external window glasses, sills and frames. You can rely on them to wash, rinse and remove the smudges from your estate’s window ledges, sills and glasses. All of the methods for sanitising which we provide are effective and don’t create any streaks. Book a free inspection of the windows in your estate. If the windows in your home, rented office, flat or other property need professional washing and sanitising, call us. Our cleaning technicians have the required skills, tools and equipment to provide safe and properly done washing and rinsing of windows in high buildings, houses and flats. They use water fed pole system to reach and sanitise external glasses, ledges and frames from the ground for windows located up to the 7th floor. They work only with purified water, bristle brushes and extensions and no chemicals or cleaning preparations. To order the window cleaning which we provide in Finsbury Park call us or use our booking form. Higher buildings will be reached with the help of platforms, cradles, ropes and lifts. Our staff are trained to work with such devices safely and well ensuring professional and effectively carried out window cleaning. Our services are available during the whole week including on bank holidays too. If you need reliable and professionally implemented window cleaning for your property that is located in N4 or nearby, contact us right away. 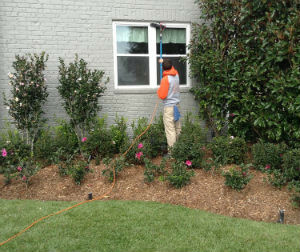 We will send our staff to inspect your property and offer you a quote.